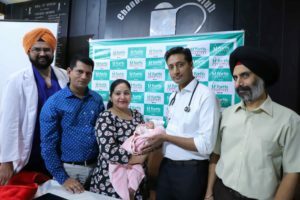 A premature baby girl born on August 12 this year at 24 weeks of pregnancy and weighing just 670 grams at birth has survived all odds stacked against her — thanks to the team of doctors at Fortis Hospital, Mohali, who left no stone unturned to facilitate the miraculous feat. Preeti Sachdevas newborn daughter, Dorothy, doctors say, was born through C-section with immature lungs. Her lungs were very immature, for which the ventilator support had to be started right from the delivery room. Thereafter, the baby was shifted to the Level 3 advance NICU of Fortis Hospital, Mohali. 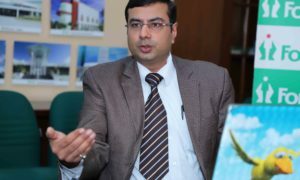 She required respiratory support for nearly 9 weeks before she could breathe on her own, said Dr Sunil Kumar Agrawal, Consultant, Neonatology, Fortis Hospital, Mohali. Praveen Kumar, father of the child, has a small spinning mill business in Samana. He travelled by bus daily for 75 days even for delivering a small milk feed. They already have a 10-year-old daughter who studies in Patiala. “This is a girl child saved despite all odds. The fact that the parents have done their best to save their precious daughter speaks volumes. They came all the way to Fortis Mohali to ensure that she is given the best care once she is born. We are proud to have facilitated their little baby girl’s miraculous escape,” said Abhijit Singh, Facility Director, Fortis Hospital Mohali. According to Dr Agrawal, at 24 weeks most of the child’s organs were not formed properly. She had to be started on intravenous nutrition for 10 days before she could digest a significant amount of breast milk. “Gradually, the condition of the baby improved and was discharged after 75 days of hospital stay. At the time of discharge, she weighed 1.4 kg. The baby was neurologically normal, accepting spoon feeds well, and her hearing and vision was normal. Most importantly, she had been blessed with the potential for a normal long-term neurological development, the doctor added. Babies born between 22-24 weeks of pregnancy are considered as babies born at the limits of viability, as they may not exist independent of the mother prior to this. But with advance technology and medical care, such micro preemies babies can be saved, that too with a normal neurological outcome. Most premature babies succumb to infection or sepsis during their long ICU stay, which occurs primarily because of lack of proper hand hygiene, use of unsterile equipment and inadequate NICU cleaning practices. However, such babies need long-term follow up for their growth and neurodevelopmental assessment. And they usually need periodical check-ups till the age of 3-5 years.